The Controlled Substance App for IllumiCare's Smart Ribbon technology helps address a "blind spot" with prescription drug monitoring programs, officials say. Prescription drug monitoring programs offer a valuable safeguard against overprescription of opioids, but they aren't perfect. A new technology being piloted at hospitals in Texas aims to complement the use of PDMPs by enhancing physicians' visibility into their patients' opioid exposure, in both hospital and ambulatory settings. Forty-nine states have embraced PDMPs to varying degrees but, as Healthcare IT News showed earlier this year, those variations in state policy, clinician uptake and efficacy of technology infrastructure mean their true impact on stemming the opioid crisis is yet to be determined. "In an ideal world we would want the information from a PDMP right in a prescriber workflow," said Cynthia Reilly, director of Pew Charitable Trusts Substance Use Prevention and Treatment Initiative. Earlier this year, the Texas Hospital Association announced the launch of an analytics technology called Smart Ribbon. 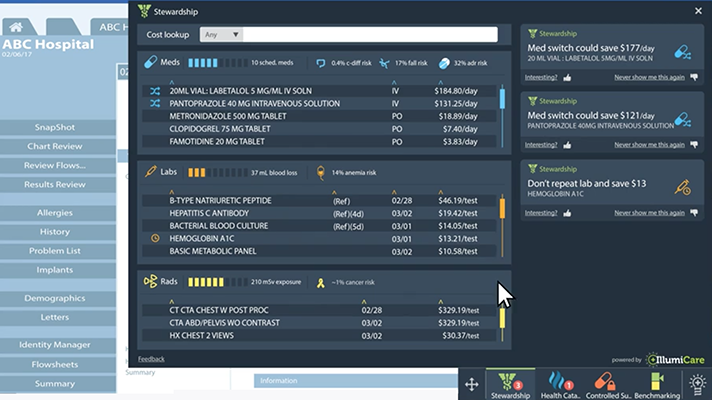 Co-developed by THA’s Center for Technology Innovation and vendor IllumiCare, the tool uses HL7 feeds to show physicians clinical and financial data, atop their normal EHR workflows – with the aim of giving them more information about the cost and clinical necessity of the tests they order. This week, IllumiCare unveiled a new Controlled Substance app for the Smart Ribbon. It uses similar techniques to combine prescription tracking data for opioids and other controlled substance into one place for quick reference, tracking both inpatient and outpatient EPCS data. More than half of non-surgical patients – and the majority of surgical patients – first get opioid prescriptions in a hospital, the company points out, with the morphine equivalent doses they receive as inpatients often having a predictive effect on their chronic use of opioids once out of the hospital. Most clinicians don't get to see that data through many existing tracking systems, however, since they only show outpatient exposures reported to state PDMPs. IllumiCare aims to address that "blind spot," officials said, by showing data from across the continuum of care to help physicians make the best treatment decisions. The new app, first available to THA member hospitals – offers insight into patients' opioid history prescription history based on PDMP data, but also tracks use in the hospital and shows alerts at peak thresholds of administration. "While important, accessing only the PDMP gives an incomplete picture of exposure," said GT LaBorde, CEO of IllumiCare, in a statement. "Tackling the opioid crisis requires hospitals to be more proactive in limiting the inpatient exposure that contributes to a person’s chronic use." Texas Hospital Association CEO Ted Shaw said the work aligns with its priorities in public policy and education on opioid risk management.